Feel the thrill of one of Costa Rica's most popular outdoor adventures with a zipline tour from San José. Soar through the rain forest canopy and above the Moliente River on a state-of-the-art zipline system boasting advanced safety features and an easy, controlled braking system. Choose a tour option including lunch and transportation from San José for a hassle-free day flying through the treetops of Costa Rica's famed natural playground. Depending on tour option selected, be ready for morning pickup at your centrally located San José hotel or make your own way to the adventure park. Dress prepared for adventure and changes in weather conditions with long pants, comfortable shoes, and a raincoat. When you arrive, get a safety orientation and gear up with a high-quality harness and all the other equipment you need. Get a ground-level view of the rain forest while walking along trails that lead to the zipline network. 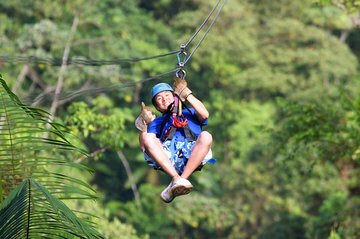 With the assistance of an experienced guide, ascend to platforms high up in the trees and feel your adrenaline surge as you let go and fly through the rain forest canopy. Cross the Moliente River below several times throughout the course, and get a view of lush hanging gardens on lower-level ziplines. This top-of-the-line course features a controlled braking system that lets you keep your hands free and enjoy the ride without worrying about grabbing a cable to break at the end of each zip line. If you choose the tour with the lunch option, take a break midday to enjoy a typical Costa Rican lunch. At the end of your high-flying adventure, relax on the return ride to your San José hotel, or make your own way back to the capital (depending on option selected). My confirmation email went to my spam file so I didn't think my reservation was completed even though I saw the debit on my card so I signed up again because my friend had ziplining on her bucket list and I knew without me going with her she would chicken out. The Grayline representative at the Aurola Holiday Inn was extremely rude when she realized that my refund should be handled through Viator and not her company asking me Can't you just look and find it on your confirmation? when I asked her for their contact info. But when I emailed them their response and the refund was almost immediate and very courteous. The highlight was ziplining. I've done it before but my friend can be a big chicken. Our two guides couldn't have done anything better. They managed her fear, kept the group moving, kept us laughing, made us feel safe....it was an amazing experience. Rainforest is a place to go!! It's a beautiful place with many animals and unforgettable landscape. We had an excellent service with our guide! !